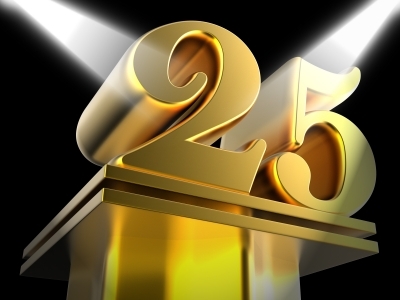 A very special event for a married couple is completing 25 years of marriage. To reach that number of years together means that during this time the couple has had a lot of love which has been the secret to keeping their marriage strong. The challenges they might have had have been resolved and therefore now they are celebrating its silver anniversary. This conclusion is very important because the couple can renew their vows and continue together demonstrating that the love between the two is much stronger than before. Because it is a special day, and taking into account that not all marriages live to celebrate its 25th anniversary, the couple celebrated with their loved ones, they will express their greetings and affection through gifts and in the day they were married. But the question is what gift can be delivered in such an event. That depends on your relationship with the married couple. It is usually customary to give gifts of silver, such as ornaments, bracelets and memorial plaques that can include a special message for the couple and data as their names and the date of their marriage. Yet we must also consider the kind of event the couple is performing. What is most used is celebrating the anniversary with a close event with family and very close friends and in such a situation it is ideally to give them a wine, a box of chocolates or silver pieces to decorate the home. There is also the tradition of giving the couple a basket of food products such as chocolates, wines, truffles, preserves, etc. On occasion the family makes a compilation of photographs of the couple and presented a special video where early courtship, anecdotes and beautiful experiences that have lived together recounted. That detail will be very well received by them both. Besides the usual gifts you can also choose other alternatives such as deliver a floral device with 25 flowers representing their anniversary issue, you can give fine clothes, candy, lotions, ornaments or invite them to dinner at a fancy restaurant where they can pass a good time. If you have a limited budget and expensive gifts are out of reach, along with other members of the family so you can give them a nice gift. If this option seems more appropriate then the gift you can give to husbands would be a trip to be much fun. This kind of gift is very appreciated, the couple will love it very much. Another idea is to organize a surprise celebration. You can make the families and loved ones of the couple have a party to celebrate together. This will be unforgettable. Remember that the most important thing when giving a gift is the love with which it is given, for the couple it will be welcomed any kind of gesture you have with them. We hope that these ideas we have recommended have been to your liking and also helpful.